Line 6 Relay G90 Rackmount Digital Wireless Guitar System. Professional Wireless Guitar System. So, what do you want from a wireless system? You want your rig to feel and sound like you’re playing through a cable! Fortunately, Line 6 gets that – and that’s why the Relay G Series is for you. Each member of the series – the Relay G30, the Relay G50, and the Relay G90 – offers up Line 6’s impressive “Virtual Wire Transmission” technology. In short, it means these systems are designed to give you the full-range sound, response, and range you expect from your guitar rig… Just like a high-quality guitar cable. There’s even a Cable Tone Simulator feature that lets you match the sound of your Relay wireless system to the sound of your favorite cable… So now you don’t have to compromise your tone just to go cable-free. What else do you need to know about the Relay G? Well, when you want no-compromise sound in a rugged, rackmountable form factor, the Relay G90 system – the one you’re looking at right now – is the way to go. It features 12 compatible channels – plenty of channels for your weekend gigs and even most festival shows with tons of other guitarists. The Relay G90 also gives you 300 feet line-of-sight to move about the stage – that’s more than enough to get interactive with the crowd and the rest of your band. All in all, the Relay G90 system gives you a rock-solid wireless solution. You touring musicians will appreciate the IEC power connector and the internal switching power supply – that way when you head overseas to tour, you won’t have to leave your wireless freedom behind. This particular system also features an XLR output in addition to the 1/4 standard output, so you can pipe your signal out to a recording interface or into the mixer to beef up your sound through the PA. Line 6 Relay G90 Rackmountable Wireless Guitar System Features. 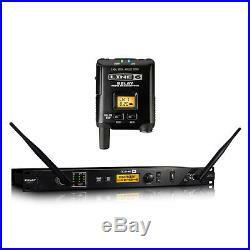 Includes a transmitter and a rackmountable receiver. Features 12 compatible channels and a 300-foot range. Internal switching power supply works worldwide for touring guitarists. Adds an XLR output for feeding a recording rig or the mixer. Incorporates Line 6’s Virtual Wire Transmission technology for great dynamic response. Cable Tone Simulator matches the sound of your favorite guitar cable. Designed to be compander free so your signal stays true. Low-noise system with high-quality 24-bit A/D conversion. Works for approximately 8 hours on just two AA alkaline batteries. Simple set of controls makes it easy for anyone to use. We will not be responsible for any such charges that they may collect from you directly. We will not be responsible for the in-transit time. The item “Line 6 Relay G90 Digital Wireless Rackmount Guitar System BRAND NEW Line6″ is in sale since Wednesday, November 6, 2013. 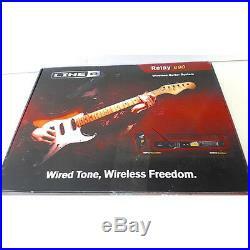 This item is in the category “Musical Instruments & Gear\Pro Audio Equipment\Audio/MIDI Interfaces”. The seller is “emrocorporation” and is located in Chestnut Hill, Massachusetts. This item can be shipped worldwide.